At last a solar charger suitable for charging the iPad, iPhone and whole variety of other handheld portable devices. With 3 x the battery capacity and 3 x the panel strength of the standard Solar Power Monkey Explorer this charger is ideal for the extreme adventurer but suitable for the family holiday too. Five years in development, the powermonkey-eXtreme is the culmination of feedback from real power users in some of the most remote locations on the planet and embodies Powertraveller's understanding of customer requirements in the outdoor and adventure travel market. The powermonkey-eXtreme houses a massive 9000mAh capacity Lithium Polymer battery and offers users real power in a compact, durable shell. You can leave The Power Monkey Extreme for up to 1 year and it will still hold 75% of its charge. 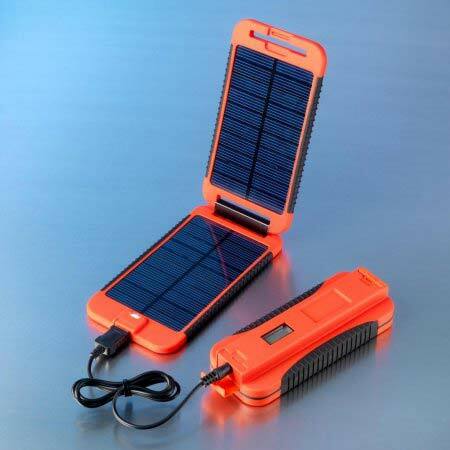 The solar panel can fully charge the powermonkey-eXtreme in approx 15 hours. Charges many other portable devices, iPod, iPhone and iPad products using the USB sync/charge cable supplied by Apple. Tips inlcuded for the latest BlackBerry, Garmin, HTC, LG, Motorola, Nintendo, Nokia, Samsung and Sony Ericsson. Mini USB, Micro USB and female USB DC cable, DC4.0 for PSP, e-readers and some digital cameras.